Relentless rain across central Pennsylvania the past few months has caused flooded roadways, downed trees and mudslides. From July 1-17 alone, we saw 8.72 inches of rainfall, which was 4.81 inches over normal amounts. What should you know if your home floods, your car floats away or you’re suddenly caught driving in the middle of a torrential downpour? Personal injury and wrongful death attorney Brian Strong offers some advice. After a flood, what are the first steps I should take for my insurance? Time is of the essence when reporting a flood damage claim. You should notify your insurer as soon as possible after the flood and let them know the state of your home or car. Before you remove any water or make any repairs, fully document the damage. You can do this by taking photos or videos of your damaged property. If you start removing water or making any repairs before documenting the damage, you could potentially decrease the extent of your coverage. You should notify your insurer as soon as possible after the flood. If you cannot get in contact with your agent, contact the insurance company’s headquarters. Do my homeowners and automotive insurance policies cover flooding? 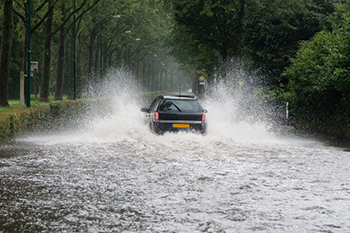 Most standard homeowners and auto insurance policies do not cover flooding unless you live in a designated flood zone. If that is the case, you are required to have flood insurance. But, if you don’t, you should still consider purchasing a flood insurance policy if your house could be flooded by an overflowing body of water or even by melting snow. You can purchase a comprehensive coverage policy for your vehicle that will cover incidences that are out of your control, such as natural disasters, flooding or hail damage. Does my flood insurance policy cover my personal property? The most common flood insurance available is offered through the federally regulated National Flood Insurance Program. Under this program, there are two policies available: one that will cover your building property (up to $250,000), and one that will cover up to $100,000 of your personal property. You can select one of these policies or choose both. This means that you have the opportunity to insure your personal possessions. Is there a wait period after purchasing a flood insurance policy? Typically, there is a 30-day waiting period from the purchase date until your coverage will take effect. Try your best to time your purchase well in order to miss the rainy season. If you can’t avoid it entirely, the wait period can be shorter if you opt for private flood insurance. These policies usually take between 10-14 days to start. If your area is under a storm watch, automotive insurers will refuse to offer you additional or new coverage. This means you will need to be proactive and purchase your flood insurance prior to a flood or related weather issue. If I’m renting a condo, should I purchase flood insurance? Flood insurance is not just for homeowners. Just like most homeowners insurance policies, the majority of renters insurance policies do not cover flood damage. If you are a renting an apartment, home or condominium, you’ll need to invest in additional insurance to protect yourself from flood damage. Be sure to read your renters insurance policy carefully in order to understand the extent of your coverage. If you’ve been injured as a result of flooding or another natural disaster, contact our attorneys at KBG Injury Law. We’ll help you get the Results You Deserve®.